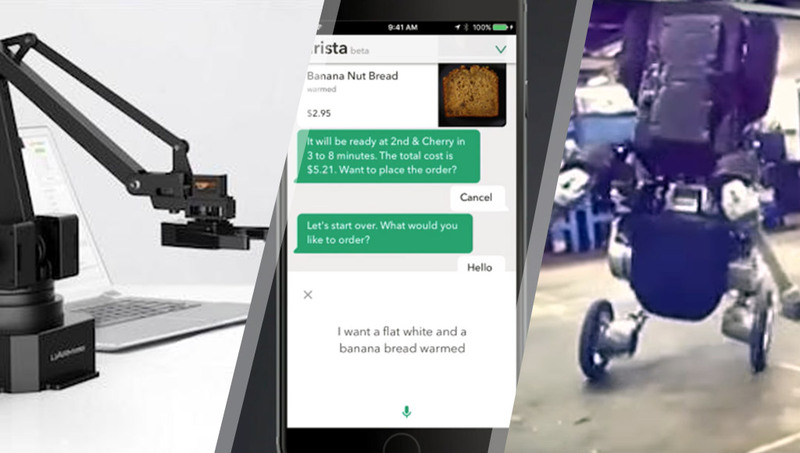 This week, we’ve got a new Boston Dynamics robotics video that’s creeping people out, Starbucks announced a virtual assistant who’ll be able to take your order on their app (and your Echo!) and you could get your very own open-source desktop robot arm! No matter where in the world you’ll be on April 29th, if you’ve got an Internet connection, you’ll be able to attend this event! The online developer conference, AI With The Best, is a great one and we’ve got discounted tickets at the link above (or use the code WTBVIP). If you’re in the Asia-Pacific, time’s running out but you can still enter the online hackathon and win $5-10k! I’ve put together a guide on how to make your own custom travel case for the HTC Vive, very useful if you travel a lot with your VR headset! The Rift might be able to handle roomscale a bit better with this update. Annie Harper and the team at Devika have been doing great work finding a VR solution to reducing unconscious bias around women’s role in the workplace. A comparison of the numbers between Gear VR and early iPhone adoption. Can we build for diverse audiences with VR? How should we do so? WebVR continues its spread into web browsers everywhere! Hooray! Looking to add a VR keyboard to your apps? Here’s a new open source one. A split keyboard for HTC Vive text input that uses the HTC Vive touchpad. Neat concept! This is actually pretty neat and could improve all sorts of displays. This AR helmet gives you heat map vision. It’s a really good use case for augmented reality and could save lives. It will recognise landscapes and augment them in particular, rather than just add overlays like snow or rain. Pretty neat! The battle for AR is heating up, in a more lame way… patent filings! If only we had interactive gyms back when I was in school! Yay augmented reality gyms! Import FBX, OBJ, DAE (and more) directly as holograms into Hololens. Looks like it’s almost a certainty by this point that Jawbone is leaving the consumer market. One designer’s exploration of designing for the Apple Watch. A patent for charging your watch as you wear it. It listens to your conversations and speech patterns… etc. It does look a little creepy, and is especially so considering that these robots are likely to be used in future military conflicts… Here’s another video. They are also introducing a Starbucks Reorder Skill for Amazon Alexa. There are a lot of different tribes in artificial intelligence! A crazy amount of them… so many approaches! This could be hugely beneficial over time. A look at building DIY surgical robots to help with healthcare. The open-source robotic arm for your desktop that you didn’t know you needed till now! If you’re keen to have Google Assistant on an unofficial Android device, this is a way you’ll be able to do it. Are we destined to fall in love with androids? Will humankind end up getting intimate with robots? What are Bluetooth Low Energy (BLE) beacons? Always been curious but unsure about the whole beacon thing? Have a read! This charge cable has LEDs that animate in a really neat way! There are a bunch of chinese knockoffs, here’s how to spot the difference. It’s coming to devices soon, but Bluetooth 5 is on developer boards now. A Raspberry Pi-powered recipe manager for your kitchen! A bit more technical but could be a neat, new way to do buttons. Got spare space in a locker? Why not make an Arduino-powered soda locker?